Combining two 9-hole scores - to make one 18-hole score - is easy...you do nothing other than enter 9-hole scores. 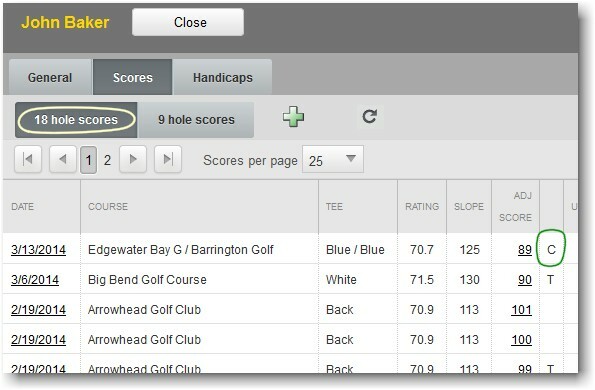 Handicap System automatically takes the most recent pair of 9-hole scores to create an 18-hole score when there is an even number of 9-hole scores. If there is an odd number of 9-hole scores, Handicap System waits until another score is added to make a complete - and combinable - pair. 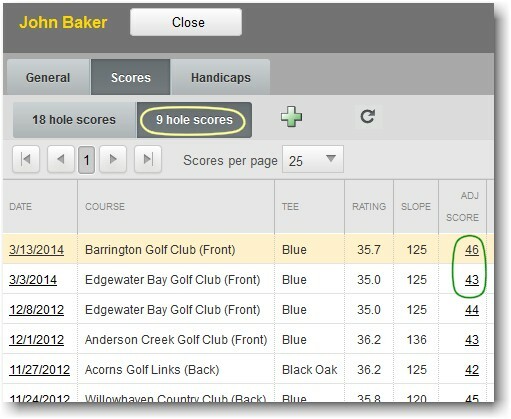 This figure shows sample 18-hole Adjusted Gross Scores (Adj Score) for "John Baker". The Date of the 18-hole score is the same as the most recent 9-hole score. In this case, since one 9-hole score was 3/3/2014 and the other was 3/13/2014, the 18-hole score uses the most recent, or 3/13/2014, date. You will also see that the 18-hole "Course" - "Edgewater Bay G/Barrington Golf" - is actually the two courses played for the two 9-hole scores. Finding the 18-hole score resulting from the combining of two 9-hole scores is easy. Look for the more recent date of the two 9-hole scores and then find that date in the 18-hole score list. The score with that date and a "C" - for Combined - next to the Adjusted Score is the 18-hole score that corresponds to the two 9-hole scores used. For example, if you look at the list of two 9-hole scores above, the more recent date is 3/13/2014. When we look for a score dated 3/13/2014 with a "C" next to the score in the 18-hole score list immediately above this paragraph, we find it is the score at the very top of the list. Editing a combined 18-hole score does not change the two 9-hole scores used. Nor does editing one or both of the 9-hole scores used change the already combined 18-hole score. If you need to make a change, the same change must be made to both the 9-hole score(s) and the resulting 18-hole score. (ii) At least seven holes must be played. (iv) Nine-hole scores are combined in the order that they are received into the player's scoring record from any club or from any combination of nines, regardless of score type. For example, a front nine middle tee score could combine with a front nine back tee score made from any course. An 18-hole score created by the combination of two nine-hole scores will display the date and course name (if applicable) of the latest nine hole score (e.g., April 29 and May 4 = May 4). 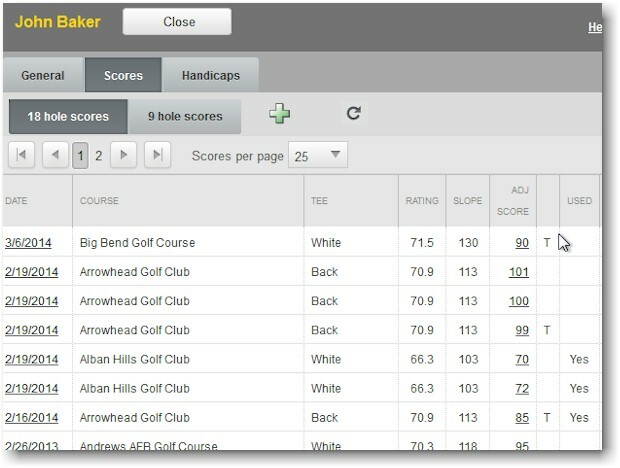 A nine-hole score will be retained for combination with another nine-hole score until it is older than the twentieth oldest eighteen-hole score in the scoring record, and nine-hole scores will be combined in the order they are received in the player's record, and "not necessarily by date."